Can you weld regular steel and stainless steel together? Any concerns about eventual corrosion? I've found a 50 gallon stainless steel diesel fuel tank off of a refrigerated trailer. 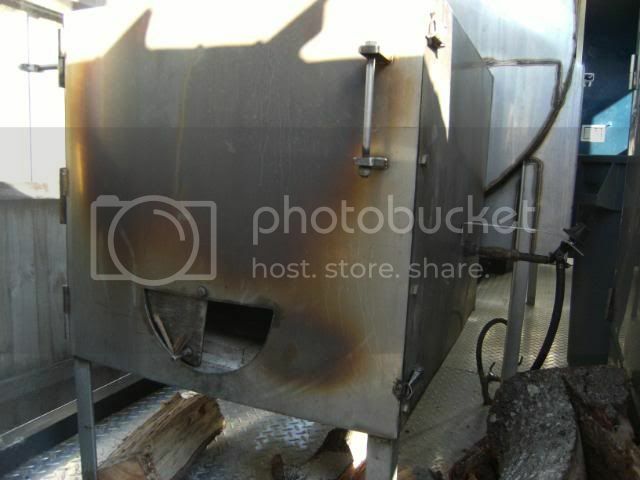 I'm looking for a tank to use as a firebox and have found 2 of these. Don't these tanks have baffles inside them? What about the diesel smell. Will burning it off get rid of the smell? Eventually I'll get all the parts together and I'll actually be able to start. BBQ Dreamer, are you sure the tanks are stainless and not polished aluminum? I have been around a lot of diesel tanks and they are usually aluminum and a 50 gall. tank should not have a baffle in it. As for your welding question, yes stainless and regular steel can be joined but the weld joint will be contaminated and will rust. k.a.m, I thought they looked like aluminum but the guy who had them siad that they were stainless. He had so much other junk, excuse me ..stuff. He probably didn't really know. I'll keep looking. I thought there would be some kind of reaction between the dissimilar metals. By the way if I didn't say it thanks for the reply to my pm of a few days ago. That's why I'm still looking for a firebox tank. I'd rather it be a little large than to small. BBQ Dreamer, you are welcome and I am glad I could help. As KAM said, yes it can be done, and yes the weld will rust. You are better off bolting something like that together. I'm a stainless guy myself, and prefer to start with fresh metal. 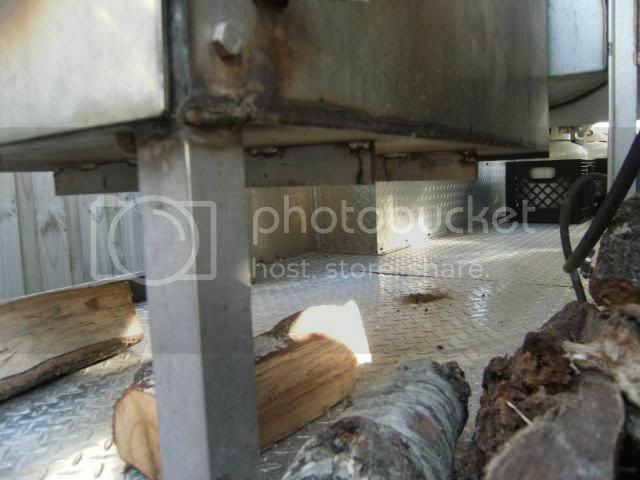 Stainless also moves quite a bit when subjected to high heat- My firebox is heavily reinforced. "I Turned A Hobby Into A Business". k.a.m. and BBQMAN are right but there's no reason not to use it just because it's stainless. The contamination you'll get from welding carbon to stainless is nothing you need to worry about. Yes, the weld can rust but carbon steel rusts anyways so what's difference? As far as stainless steel moving when subjected to high heat, yes it'll move but it's not like it'll move that far. For the purpose you want it for, if the price is right, and its the size you want, I'd have no problem using it. Remember though...you can't use a torch to cut stainless. You'll need a plasma cutter or cutting wheels. As far as stainless steel moving when subjected to high heat, yes it'll move but it's not like it'll move that far. A far as the cook chamber at normal smoking temps stainless of 16 ga. or heavier works out just fine. The 2" 11ga wall tubing across the (inside) top kept the flat top of the firebox from ballooning outward and making it unusable for bean pots etc. 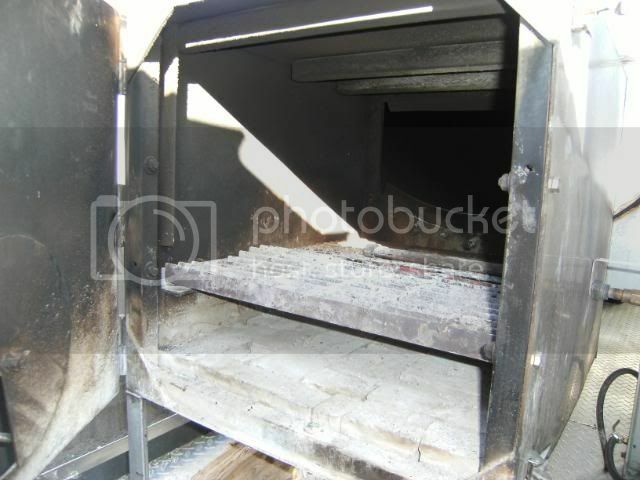 The bottom has a firebrick floor to keep raw heat off of the bare metal. Take a close look at the 1 1/2"x 3/8" stainless bar (naturally welded on-end for strength) in the last picture. Thanks guys. I'm not in a rush so I'm going to keep looking. There is bound to be a 40-50 gallon carbon steel (learned something new today) tank out there somewhere with my name on it. The design phase was completed when I saw "farmer fox's" build. Love it. I plan a few modifications of the original design but the end product will definitely be recognizable as his. I'm in the parts collecting phase right now. I have 2- 80 gallon air compressor tanks but I really don't want to cut one up for a firebox. We'll see. BBQMAN...I agreed with you 100% on flat ga steel. St Stl or carbon. I was assuming the tanks were cylindrical in shape. I've seen 3/8" - 1/2 flat steel warp under "firebox" temps. On industrial heat treating furnaces. Thats why the best ones are cylindrical or have major reinforcements. Stainless moves more than mild steel during welding or heating. Quite a bit more, actually. Depending on the electrode metal, the weld metal may rust, or it may not. I got a box of 3/32" electrodes which are useful for welding dissimilar metals. I used those for welding replacement teeth onto a backhoe. The backhoe came back for a different repair, and the bucket and teeth were slightly rusted as usual, but the weld metal was shiny. An interesting way to join stainless is to MIG braze it using silicon bronze wire (or perhaps phosphor bronze wire, if you can afford it). I've seen it done and it worked great. Much less warping than welding. Can use C25 or plain argon for shielding gas. I don't know how to definitively tell nonmagnetic stainless from aluminum. I generally tell by weight (density) or appearance. You'll know soon enough once you try to cut or weld it, though!